A dozen of passengers - six males and six females - have died in a road accident, which also left five other persons injured yesterday on the Lagos-Ibadan expressway. 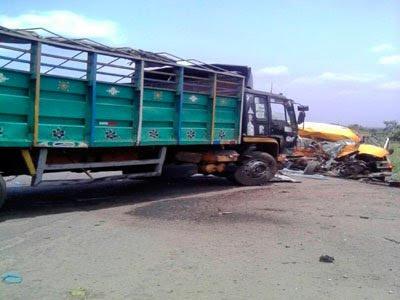 It was gathered the accident occurred in the afternoon when a commercial bus collided with a truck at the Ogunmakin (Ogun State) stretch of the expressway near the Foursquare Camp. It involved a truck marked LSD 138 XQ and a bus with registration number AAA 886 XR. The accident, according to The Nation, created a massive traffic gridlock for travellers on the highway with operatives of the Federal Road Safety Corps (FRSC) and Ogun State Traffic Compliance and Enforcement Corps (TRACE) sighted frantically clearing obstructions, evacuating victims and re -directing traffic. The Public Relations Officer of TRACE, Babatunde Akinbiyi, who confirmed the accident, said 17 people were involved. He confirmed 12 people died on the spot with five persons were also injured. He noted that the injured were taken to the IFE-OLUWA PLUS Hospital Ogunmakin while the dead victims were taken to the FOS Mortuary Ipara, Ogun State.